The CarbonNet Project in Australia is investigating the potential for establishing a world class, large-scale, multi-user carbon capture and storage (CCS) network. The network could integrate multiple carbon dioxide (CO2) capture projects in the State of Victoria’s Latrobe Valley, transporting CO2 via a common-use pipeline and injecting it deep into offshore underground storage sites in Victoria’s Gippsland region. The establishment of a successful CCS network would support the development of new industries in Victoria. Positioning Victoria as a hub for CCS provides a substantial opportunity for new jobs and to boost skills. This report covers the results of a focus group based research project aimed to understand how residents of the State of Victoria, Australia perceive and accept potential CCS projects. 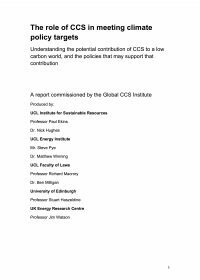 The results demonstrate there is limited awareness of the technology and a need for information and education on CCS. A proportion of the respondents (more than 32%) had questions of a “technical” nature, suggesting that participants sought additional information while considering their acceptance of CCS technology. These questions related to topics including procedures, CO2 properties, CO2 behaviour, impacts, potential for disasters, risks of leaks and aquifer damage and the ability to use existing infrastructure. Participants also raised issues that adopted a broader perspective, such as asking whether CO2 has alternative uses, and what comparisons and evaluations had been carried out to justify the decision to develop CCS compared to other potential climate mitigation technologies. Discussion also encompassed the economic status and prospects of CCS, the connection of CCS to a carbon price, the development of CCS internationally and the interests and institutions supporting CCS.